Sunflower Project is on the 4th project of 2014, carried out by Eco Vietnam Group, in collaboration with Nanyang Technological University (Singapore). 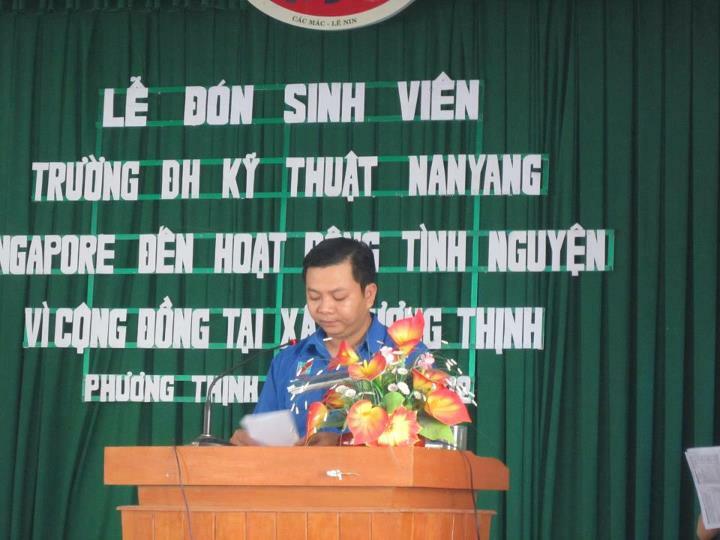 The main objective of this project is to improve the lives of people, especially the children at Phuong Thinh, Dong Thap. 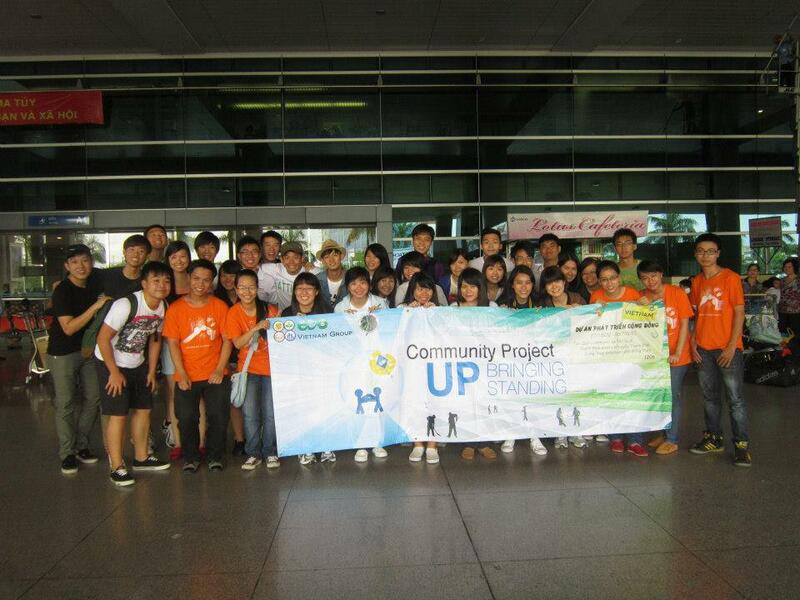 The project is spearheaded by 33 students from NTU, 6 volunteers from Vietnam and the support of members of EVG. Sunflower Project is the first project in the series of 3 construction projects in the village pre-school room roof lamp, Phuong Thinh commune, Dong Thap province. 1 preschool classroom, 1 reservoir, and 1 toilet. The total value of all these projects is around 270 million. All of these were built by the students of Vietnam and Singapore, with the guidance and support of the local construction team. The first day of the construction was the most difficult, as the methods of evacuation is extremely rigorous. Many students described the process as a ‘never-ending chore’. 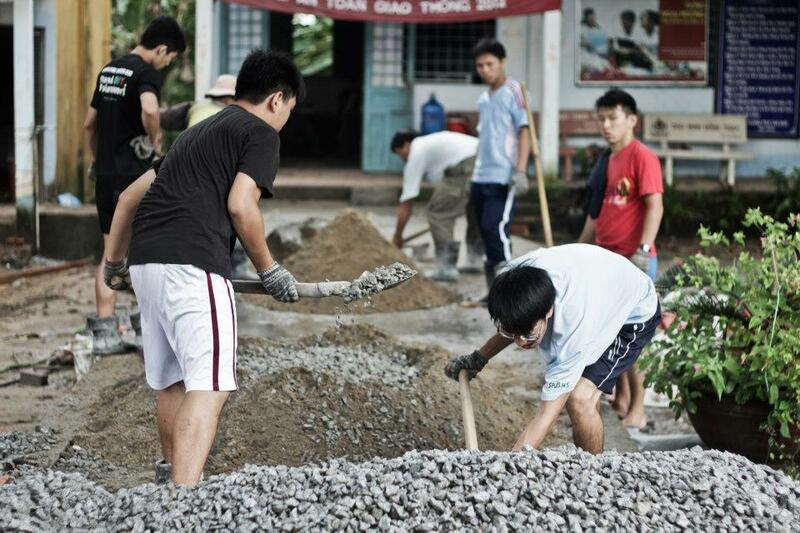 Singaporean students and Vietnam volunteers were overwhelmed by the work on the first day. However, everyone was very happy, patient and enthusiastic to get the work done. The first day construction of the Kindergarten was the most difficult day. Firstly, we have to do excavation work, which many of the students described as a ‘never-ending chore’. 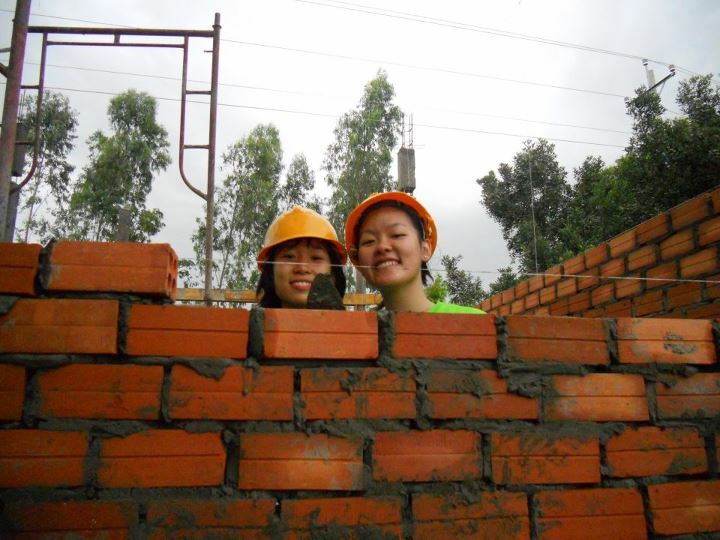 Singaporean students and Vietnam volunteers were shocked with the amount of construction work that had to be done on the first day. However, everyone was very happy, patient and enthusiastic to get the work done. Teachings always bring joy and excitement to all Singaporean and Vietnam volunteers because of the enthusiasm and the friendliness of the children here. In the project, the children learnt to sing in English and fold origami. Constructing of the classroom became easier after the tough excavation stage. We were very lucky to have the enthusiastic support of local construction worker to work together with us. The next day, we continue with the mission of construction such as mixing tank, loading bricks. 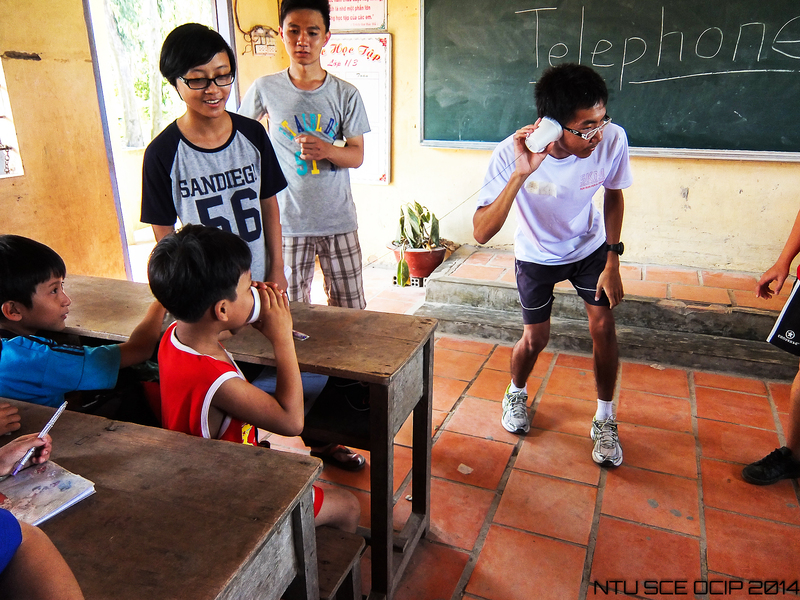 One of the Singaporean participants shared that she was most interested to learn the setting up of telegraph poles. Night Cultural exchange was filled with a series of sophisticated repertoire of local, NTU and Vietnamese volunteers’ performance. 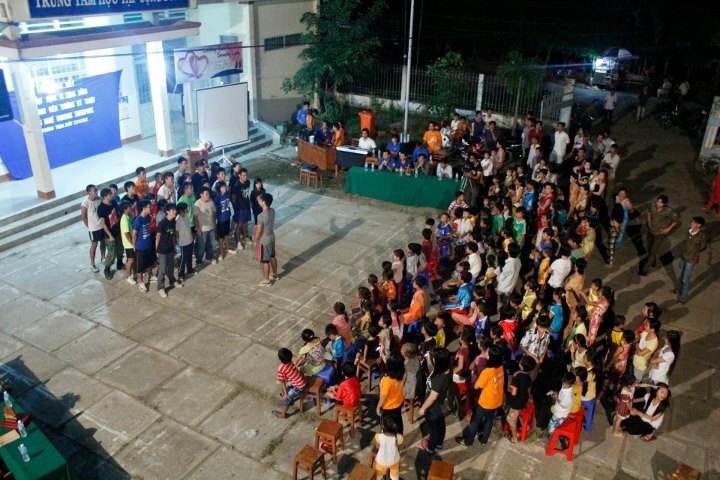 It was certainly a memorable night, as we forged unforgettable experiences together with the people in The Thinh commune. After the project, the group went on to Cu Chi tunnels tour. Throughout the tour, the group explored and learnt about the illustrious history of Vietnam. At the end of the journey, we went separate ways, and what remained were the memories shared together with the volunteers, friendship and experiences etched into our heart forever. In a short period of time from 17/7/2012 to 1/8/2012, ECO Vietnam Group (EVG) was having the privilege to cooperate with OVE Welfare Service Club from Nanyang Technology University (NTU) – Singapore. 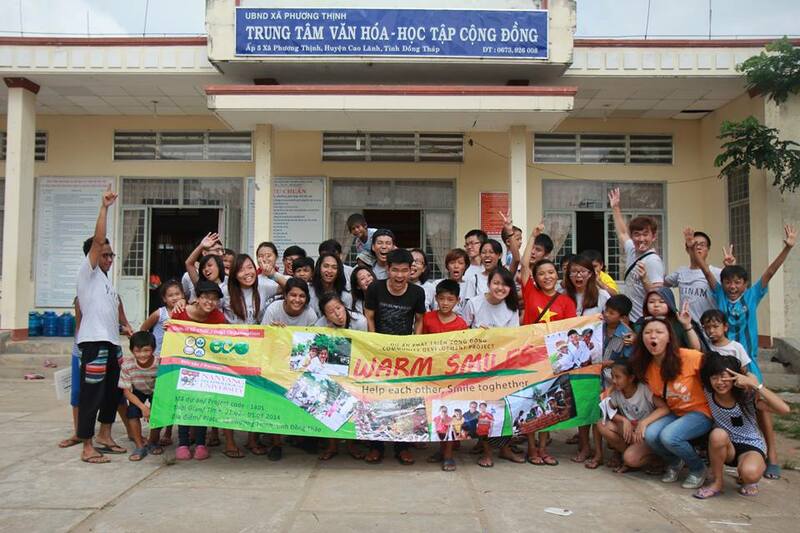 We worked together to run the community project – UP in Tan Quoi commune, Thanh Binh, Dong Thap District, HCMC Vietnam. With only 2 weeks in hand, but having enthusiastic spirits, hard-working and tireless determinations, our volunteers from EVG and NTU had successfully brought genuine benefits and made major improvements to the life of the people in Phuong Thinh Commune. This project is definitely one of the most memorable journeys in their lives. Early morning 17/7/2012, the volunteers from EVG met the volunteers from NTU for the first time in a delightful and friendly atmosphere. All was looking for the journey ahead them with much joys and eagerness. In project UP, the biggest mission and also challenge for the volunteers was building a school yard. Even though there was many obstacles and problems along way since they were all new to the job but with the enthusiasm to serve the community and the eagerness to learn new knowledge, the volunteers did become more and more like professional workers. More than that, under a very harsh weather condition with the burning sun, our young volunteers still maintained their determinations to serve and develop a better life in Phuong Thinh. They always did their best, they were ready to conquer new challenges and they did everything with much love for the community they served. On the other hand, the volunteers not only built the school yard but also taught English to children in the commune. They shared that every time they saw the smiles and the efforts to learn in the children from this poor region, they were even more motivated to teach and help their students to learn more and more. 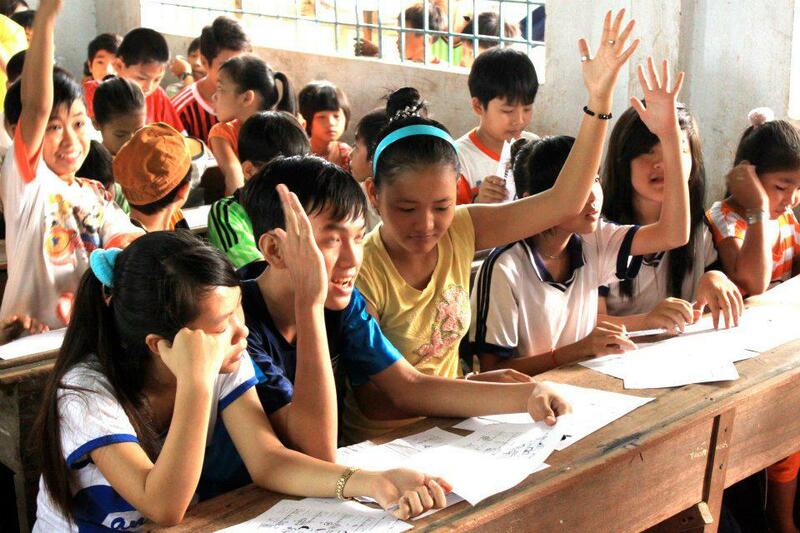 Moreover, the volunteers also used their precious time in Phuong Thinh effectively to every second. 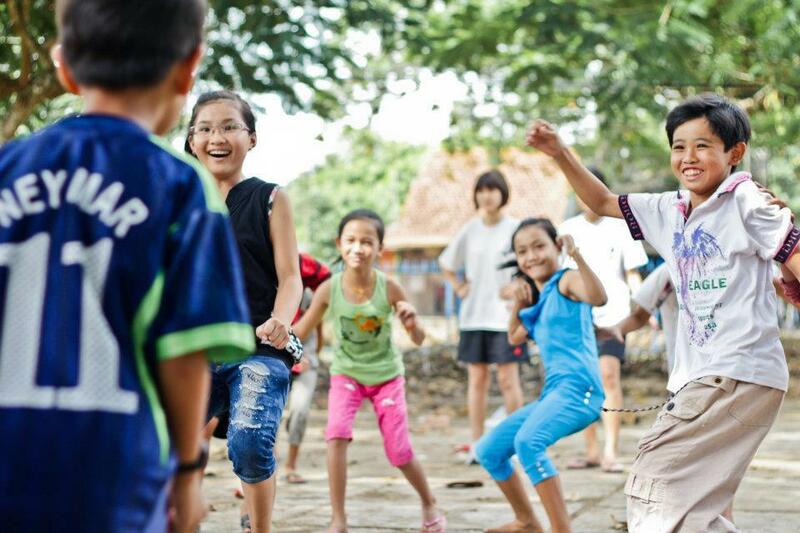 Beside from all the hard works, they organized game activities for the children in order to give them a fun and delightful experience that Phuong Thinh’s children rarely have a change to enjoy. To the volunteers, the laughter from all these kids was the medication for their tiresome, which motivated them to continue their hard works. 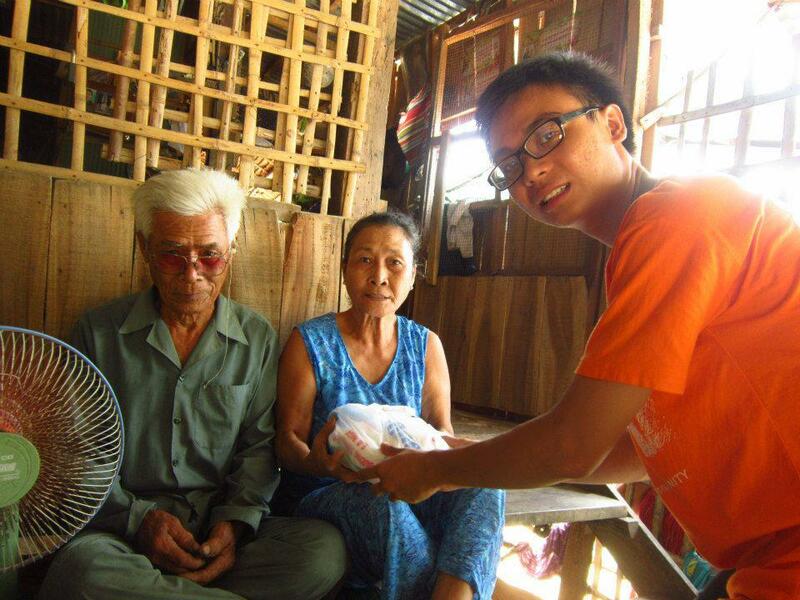 In addition, EVG and NTU also volunteers visited many poor households in the commune. This activity helped them to have a clear look at the poor life in Phuong Thinh; it also made them understand deeply about the people in this commune. Vice versa, the people in Phuong Thinh were giving the hope and belief that there is someone that care for their life condition and willing to offer help anytime. Before closing the project in Phuong Thinh, our volunteers had organized a Culture Exchange Night, in which, they sang and danced together by the fire. They played with the children and people in Phuong Thinh and they became closer than ever to each other and to Phuong Thinh’s people as well. This project has been a great blessing for the Phuong Thinh community and the participants as they managed to refurbishing 3 classrooms and an ECO Love House. This project cannot be completed without the hardwork of youth from Hall 14 Nanyang Technological University Singapore and volunteers from ECO Vietnam Group. The project was conducted in Phương Thịnh commune, Cao Lãnh , Đồng Tháp District, Vietnam – where the common life is living with flood, poverty and making end meets days by days among difficulites in education , transportation any many more. Morning 14.6.2012, volunteers form ECO Vietnam Group started the project by picking up our lovely Singaporean friends from Nanyang University of Technology . After months of working together online preparing for the project, it was pleasant to finally meet each others. The greating and welcoming were covered with delight and excitement for the journey we’d shared in the next few weeks in Phuong Thinh commune. 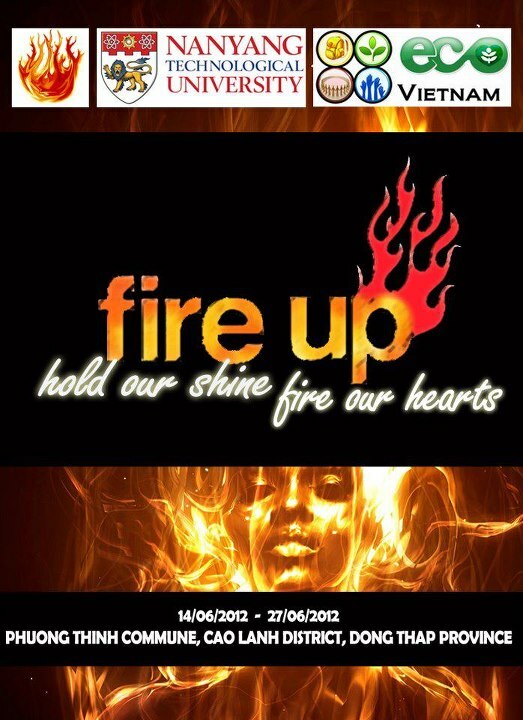 For almost all the volunteers, participating in Fire Up project was a new experience. They had the chance to work hard as a constructor. Things seemed to be easy at first turned to be extremely challenging, from carrying tons of bricks, mixing cement to bending iron and building walls, etc. 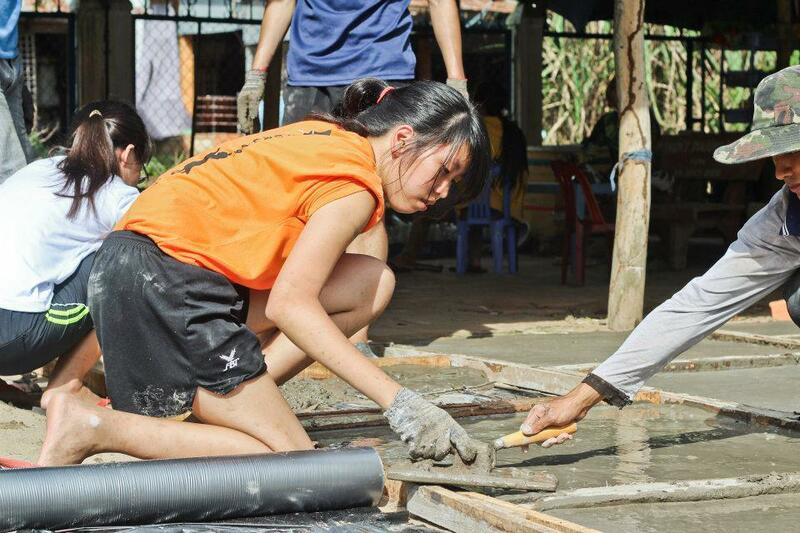 Even though hardship existed in every works, our volunteers always showed the best attitude and responsibility. They pushed through all obstacles, ignored the burning sun, the unexpected rains to finish their job. What gave them the strength was the thought of a better life the people in Phuong Thinh would possibly have thanked to their hard-works. 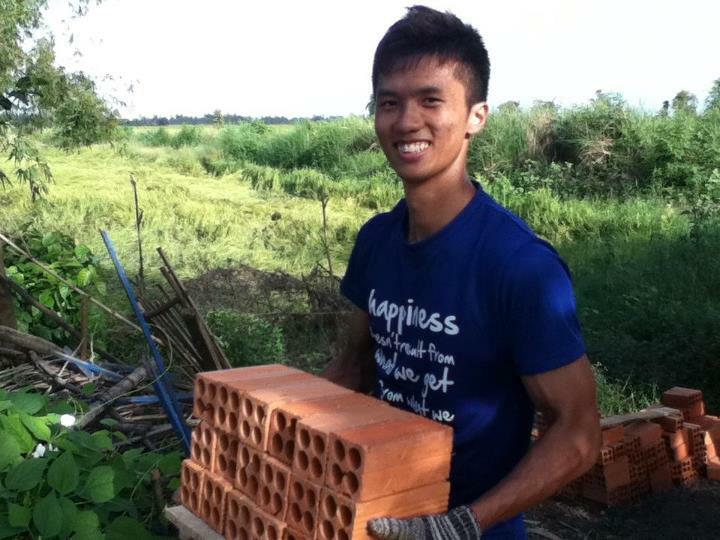 Carrying tons of bricks and always put a smile on their faces. Came to Phuong Thinh commune, at first it was understandable to expect the burning sun in here would shut down all the excitement and determine. Nonetheless, it only made our volunteers’ enthusiastic burned even brighter. 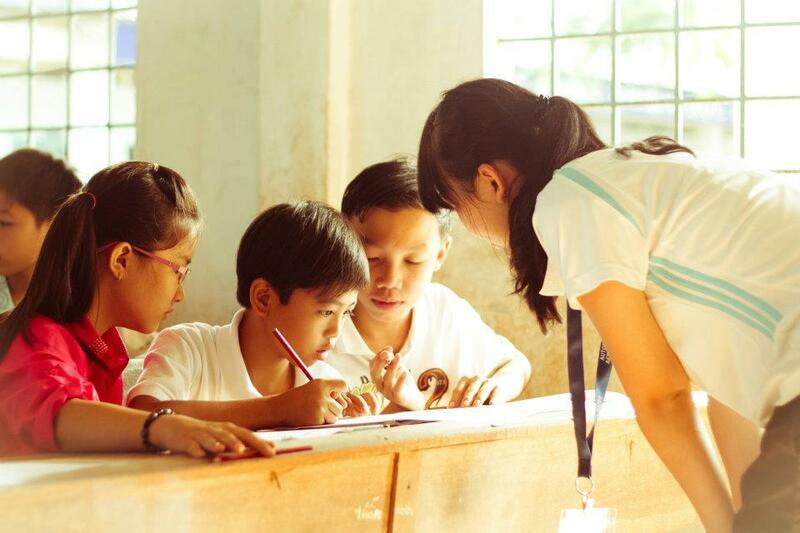 Along with building house for the poor households, our volunteers in Fire Up project also re-furnished many classrooms for the young generation in Phuong Thinh. They put their hearts in every single works. Seeing them carefully painted doors by doors, planted trees by trees were precious scenery could be found during those days in Phuong Thinh commune. 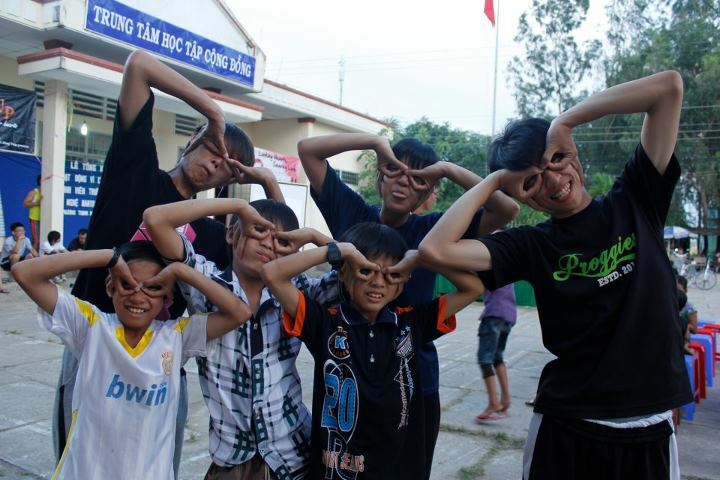 Also in the project, our volunteers came and visited many poor households in Phuong Thinh commune. Each visit helped them to understand more of the harsh lives in this poor land. Beside all the working hours during Fire Up project, the volunteers still found time to create many unforgettable memories together and with the lovely people in Phuong Thinh as well. From culture exchange stories during house-works to friendly football match with the commune’s boys , their friendship grew into a loving , unbreakable tie across countries. 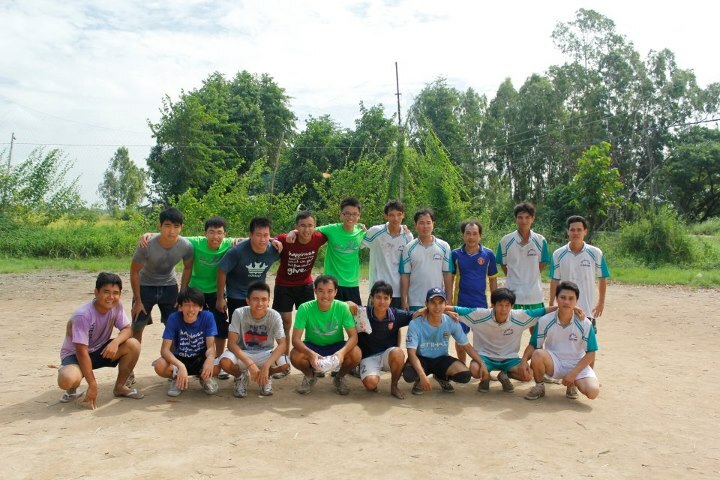 Football match with the commune’s boys. After the project, although the weather condition was harsh and facilities weren’t any close enough, with loving hearts and volunteerism nature , our volunteers had planted 100 trees, re-furnished 3 schools, visited 3 households, taught English to poor children and built one ECO Love House. These contributions, even though are small but they are the start of hope for a better life, better future in Phuong Thinh. That’s the precious achievement all volunteers in Fire Up project did. “Fire Up” only lasted for 10 days, but all the things our volunteers left behind will forever stay in Phuong Thinh. A short journey in term of time but is endless in each individual mind. 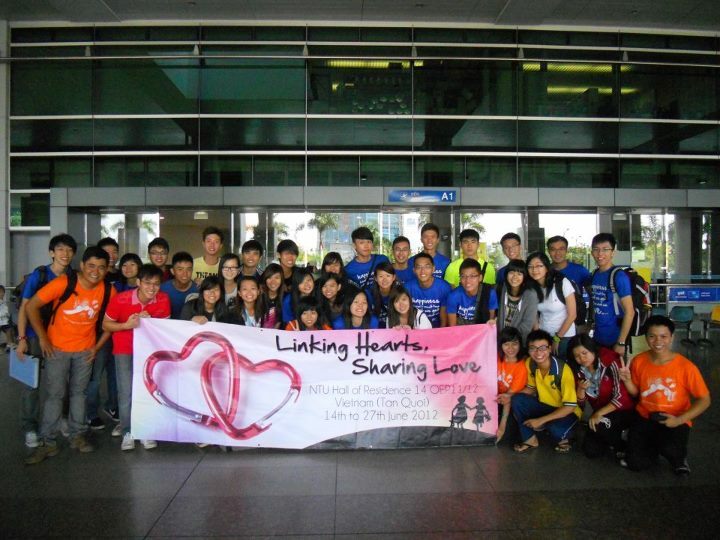 This is the journey that EVG volunteers and NTU students will never forget.